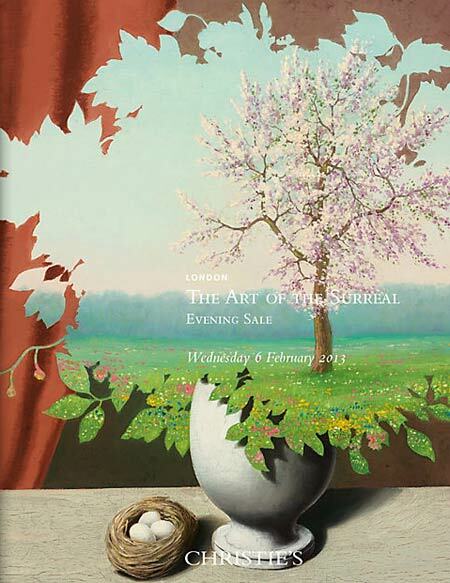 Both leading international auction houses Sotheby’s and Christie’s announced Surreal Art Sales in London on 5th and 6th of February, 2013 . CHRISTIE’S: Painted in December 1939, L’Echelle de l’évasion (The ‘Ladder of Escape’) by Joan Miró (1893-1983) is one of two pivotal works with this title which he executed at this significant period in his career (estimate: £5-8 million). The other one, a gouache from January 1940 – which is one of the very first of the artist’s Constellation series – is now in the Museum of Modern Art, New York. The ‘Ladder of Escape’ was an important and much repeated motif throughout much of Miró’s work from the early 1920s onwards. Seemingly bridging two worlds, the ladder often served as a potent metaphor for the artist’s own ‘escape’ from ‘reality’ into the world of his art. 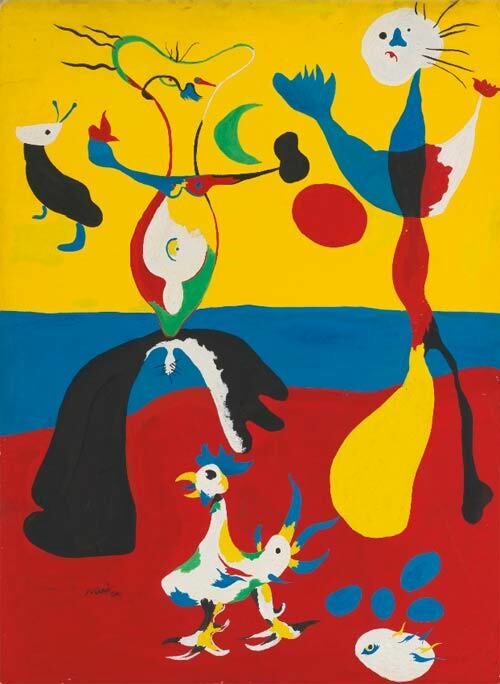 Executed whilst living in Normandy, France, during the months of the so-called ‘phoney war’ of 1939 when France anxiously awaited the German invasion, L’Echelle de l’évasion is the culmination of a series of new works marking Miró’s flight from the grim realities of Europe’s present circumstance. It was amidst the relative stability and rustic calm of the Normandy countryside that he was able to focus his energies and experience on the creation of an intensified vision that embodied several of his favourite themes: birds, women and, above all, the night sky. 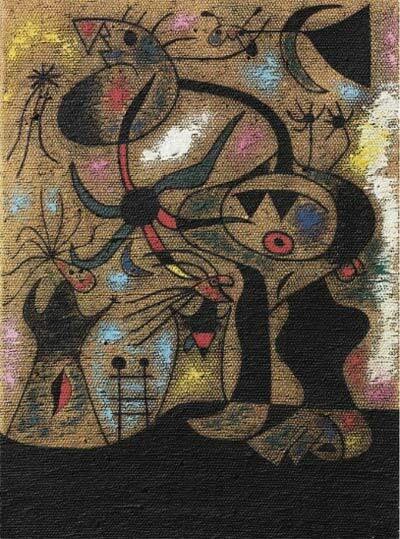 In the wake of Franco’s victory, Miró sought an art that would deliberately invoke a universal sense of the mystery and magic of life, aiming to create an art whose inventiveness, originality and playfulness would sparkle and shine in direct contrast to the encroaching darkness and tragedy that he and many others now felt surrounding them. One of the very last of nine paintings executed on burlap, known as the Varengeville II series, L’Echelle de l’évasion is among the most colourful and densely worked of these pictures. 22 7/8 by 16 3/4 in. SOTHEBY’S: Executed in 1936, Le fermier et son épouse is a powerful composition from one of the most turbulent periods of Miró’s career. It was during this time that he was attaining a wide-spread international recognition, with his works featuring in now legendary Surrealist exhibitions including the International Surrealist Exhibition in London and Fantastic Art, Dada & Surrealism at The Museum of Modern Art in New York, both held in 1936. Painted in the lead-up to the outbreak of the Spanish Civil War in the summer of that year, the intense, brilliant colours of the present work and the exaggerated biomorphic forms are highly characteristic of Miró’s paintings executed during this turbulent time. Charged with extraordinary emotional and creative power, it is populated with striking figures set against a blazing landscape, painted in blocks of bold primary colours. Writing about Miró’s works from 1935-36, Jacques Dupin has commented: ‘The serene works of the years devoted to concentration on plastic concerns and to spiritual control of figures and signs now gave way to a new outburst of subjectivism, to an expressionistic unleashing of instinctual forces. The volcano which for some years now had been quiescent suddenly erupted’ (J. Dupin, Joan Miró: Life and Work, London, 1962, p. 262). For all their explosive power, these works are executed with great care and precision, the fantastical creatures rendered with great attention to detail and control. Miró conveys the intensity and fear that pervaded Europe at this time, but never allows his art to be overwhelmed by it – he remains sure-handed and the master of his imagery. The present work depicts a Catalan farmer and his wife, surrounded by farm animals in the landscape of Montroig. Miró’s love of the countryside dates back to at least 1911 when his father purchased the farmhouse at Montroig that was to play such an important role in his subsequent life and work. 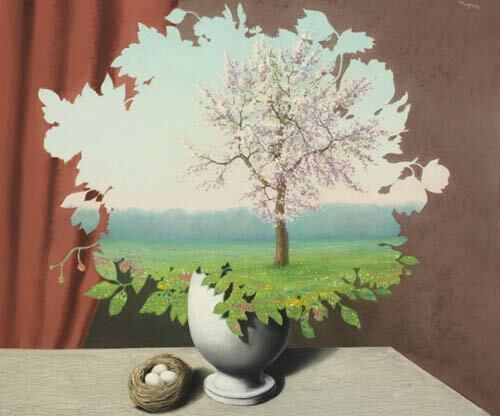 CHRISTIE’S: A remarkable group of nine works by Renè Magritte (1898-1967) – the largest array by the Surrealist master to be offered since Christie’s Harry Torczyner sale in 1998 – is led by Le plagiat (Plagiary), 1940, which unites nature, beauty and mystery (estimate: £2-3 million, illustrated right). Never before offered at auction, it has been in a private Belgian collection since it was painted. This is an incredibly rare work as while many of Magritte’s motifs were revisited in a string of pictures, he created only one other oil painting titled Le plagiat, in 1942 in a vertical format. This work shows the elective affinities which underpinned the greatest of his paintings: a bunch of cut flowers has been shown in a vase, yet instead of the flowers themselves, the viewer sees a related subject, a blooming landscape in a cut-out silhouette. Next to the white vase is a nest with three eggs, an enigmatic presence in the interior view which again allows the outdoors to invade an indoor space. First exhibited in a Salon in Liège in 1940, the year it was painted, Le plagiat was acquired from the exhibition by Ernest van Zuylen, a member of a wealthy merchant family who was both a keen supporter of the arts and a prolific photographer. Magritte painted this original, first version of Le plagiat in January 1940, shortly before the invasion of Belgium but after the beginning of the Second World War. This was a moment of incredible international tension, not least for an artist associated with a subversive view of the world and with political statements that one could imagine would not sit well with any occupying forces. While some artists, especially among the Surrealists, sought to channel, express or address this tension, Magritte instead sought to create a slender ray of light, a beacon of hope. A meditation on beauty, Le plagiat shows a room filled with a bunch of flowers which itself becomes a form of window or portal opening up to a lyrically idyllic landscape. Magritte continued to channel positive feelings in his work throughout the Occupation, following the invasion which occurred only months after Le plagiat was painted. SOTHEBY’S: Les belles relations combines several recurrent preoccupations of Magritte’s art, such as the depiction of faceless, unidentifiable figures, objects suspended in the sky and the juxtaposition of human flesh with everyday objects and landscapes. The fragmentation of the human body and depiction of isolated body parts is not only an important theme in the works of René Magritte, but also one that expresses the essence of Surrealism in general. It contains two concepts central to Surrealist art: that of desire and fetishism, as in the works of, amongst others, Salvador Dalí and Joan Miró, and that of threat and violence, such as in the early sculptures of Alberto Giacometti. Magritte’s use of such imagery and body parts, however, is rarely violent. Rather than evoking a mutilation of a human body, he uses its segments in the same way he would isolate a segment of a landscape or an object and place it in a different, unexpected environment. 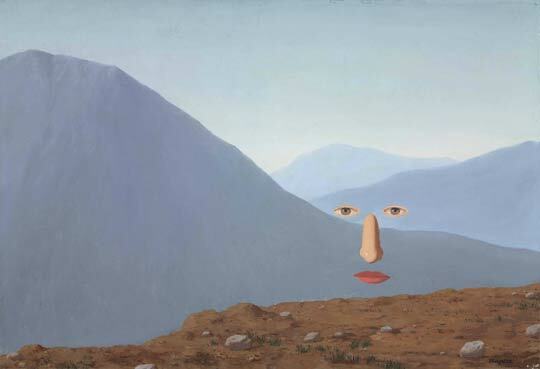 In the present work, a sense of mystery and ambiguity is created by placing the oversized facial features – eye, nose and mouth – against a quiet, unidentifiable landscape dominated by a vast cloud-filled sky. By changing the context in which we are used to seeing these images, the artist challenges our ideas of the visible world and of the nature of art itself. A similar juxtaposition of body parts appears most famously in Le Viol, in which Magritte superimposed a woman’s facial features onto her torso. It was the image of the eye, however, that particularly fascinated Magritte (fig. 2) like many other Surrealist artists: Man Ray famously used a photograph of Lee Miller’s eye in his Indestructible Object; Picabia often depicted figures with multiple pairs of eyes in his ‘Monster’ paintings, and Luis Buñuel used it in the celebrated sequence in Un Chien Andalou. They all find their precursor in the sinister, mysterious works of Odilon Redon, such as his L’Œil, depicting an isolated eye. Furthermore, Redon’s celebrated image Œil-ballon (fig. 3) might even have provided the inspiration for the juxtaposition of the eye with the balloon. CHRISTIE’S: A miraculous apparition dominates Tous les jours (Everyday), painted by Renè Magritte (1898-1967) in 1966 (estimate: £1.8-2.5 million. Having joined an important private collection only a year after it was executed, it has remained in the same collection – from which it is now offered – for over 40 years. Against the backdrop of a dramatic, largely barren, landscape are the eyes, nose and mouth of a man, hovering in the air and bracing the viewer with an uncanny gaze. Tous les jours was one of a group of pictures that Magritte created during this period, exploring the concept of emptiness and combining it in several cases with the tradition of portraiture which he had gleefully disrupted and undermined throughout his career. The face of the subject appears almost discernible, despite being fragmentary, in part due to the striking scale of the nose. In this sense, Magritte has conveyed an impressive but certainly ambiguous sense of realism through this deliberately absurd composition. Such isolation of facial features first appeared in Magritte’s work only shortly before this picture was painted in Le paysa ge de Baucis, which had emerged as his solution to one of his visual quandaries: how to represent the space between a woman’s hat and her dress. 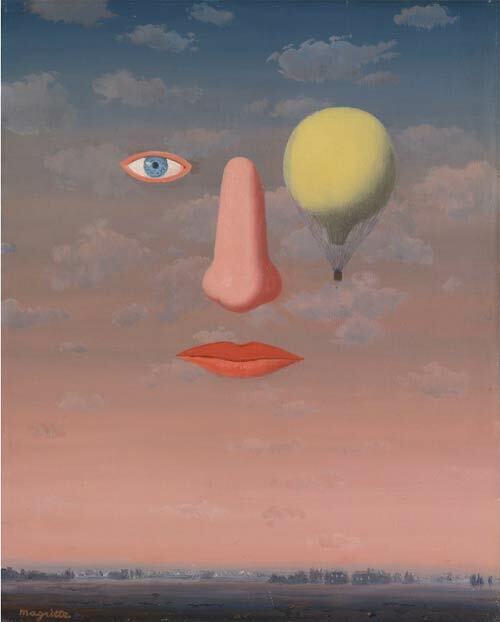 In 1966 he found the solution in male form noting: ‘I have discovered how to paint the emptiness between a hat and a man’s suit without suggesting “The Invisible Man” ‘by including floating facial features – the eyes, nose and mouth – which articulate and dramatically highlight the ‘emptiness.’ In Tous les jours, emptiness is pushed to a new extreme as the face is shown against a vast background, rather than hanging within the context of a human head and body. The contrast between the flesh and the rock-strewn scrub and mountains of the landscape adds a textural dimension to the tension between these disparate elements thrusting them into bolder relief. A face appearing in such fragmentary form appears to relate to Magritte’s earlier series, in which the eyes and mouth of a woman appeared in the midst of strings of pearls. SOTHEBY’S: Dalí’s riveting depiction of the legendary Mona Bismarck (née Strader, 1897-1983) is among the artist’s most accomplished portraits. When Dalí painted this work in 1943, Mona was married to Harrison Williams, reputed to be the wealthiest man in America. After their marriage in 1926 she swiftly became known as one of the most glamorous and beautiful women in New York, being named ‘the best-dressed woman in the world’ by the luminaries of fashion. Williams’s vast wealth and elevated position afforded Mona a lavish lifestyle, dividing their time between residences in New York, Palm Beach, Paris and Capri. Harrison Williams died in 1953, and in 1955 Mona married her longtime friend, Count Edward von Bismarck, the grandson of Chancellor Otto von Bismarck, whose aestheticism and charm found a perfect partner in Mona. Portrait of Mrs Harrison Williams is an astonishingly sumptuous rendering of her remarkable character. The entire composition is filled with classical allusions and surrealist symbolism, making it one of Dalí’s most ambitious pictures to date. 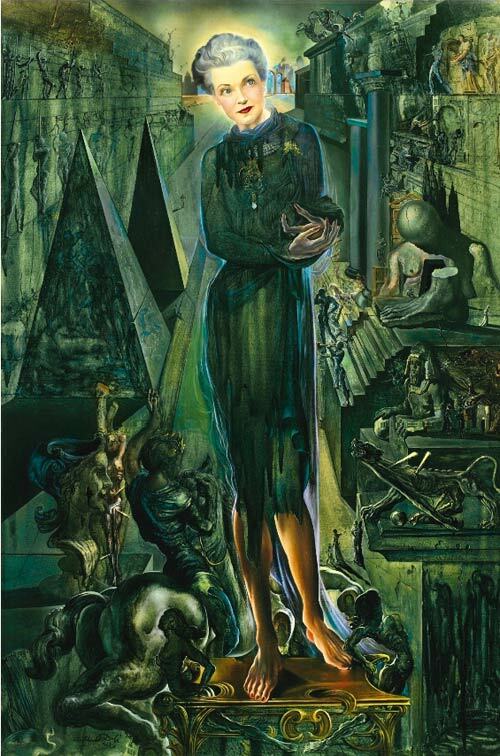 Dalí executed Portrait of Mrs Harrison Williams at the height of his successful years in New York City. After having fled Paris with his wife Gala in 1940, Dalí assumed a central role amid the society of European Surrealists that had coalesced in New York at the outbreak of World War II. The artist later described this transition, ‘I needed, in fact, immediately to get away from the blind and tumultuous collective jostlings of history, otherwise the antique and half-divine embryo of my originality would risk suffering injury and dying before birth in the degrading circumstances of a philosophic miscarriage occurring on the very sidewalks of anecdote. No, I am not of those who make children by halves. Ritual first and foremost! Already I am concerning myself with its future, with the sheets and the pillow of its cradle. I had to return to America to make fresh money for Gala, him and myself’ (quoted in Robert Descharnes & Gilles Néret, op. cit., vol. I, p. 342). During this period, the artist was championing his paranoiac-critical method – his term for the controlled use of freely associated imagery and subjects derived from self-induced hallucinations. These fantastical apparitions often took the form of reoccurring motifs in his work such as the bust with the bowed head seen towards the right of Mrs Harrison Williams, which had featured in Le bureaucrate moyen (fig. 1) in 1930, and subsequently in a stage set of 1941. Alongside iconographic elements of his own devising Dalí has included myriad references to monuments from the past such as mythological beasts and baroque horsemen (figs. 4 & 5), an Egyptian sphinx and the martyred St. Sebastian. There is a distinction to be drawn between this method and the Automatism of many of his fellow surrealists. Whereas Automatism relies on unreflecting response to stimuli and chance occurrence, Dalí’s approach to the irrational was manipulated consciously to fulfil a pre-established conception of a subject. In addition to his renewed intellectual aspirations Dalí was ‘claiming to have discovered for the first time in his life the real way to paint; in other words, with over- and underpainting. For him, this is infinitely more subtle in its tonalities than the pictures painted before’ (Robert Descharnes, Dalí, l’œuvre et l’homme, Lausanne, 1984, p. 142). This discovery of the finer techniques of painting gives the present work its striking luminosity and the precision of a Renaissance masterpiece. This period was the zenith of Dalí’s technical virtuosity, when the fruits of his prodigious subconscious could be represented with pristine detail. 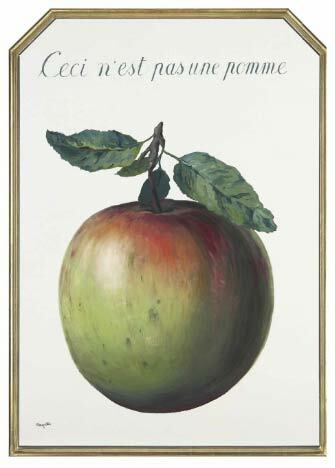 CHRISTIE’S: A further important work by Magritte Ceci n’est pas une pomme (This is not an apple), 1964, (estimate: £1-1.5 million) leads a group of four works in The Art of the Surreal Evening Sale which are offered from the former collection of the Scheringa Museum of Realist Art, Holland, as agreed by the Administrator of DS Art B.V., part of the DSB Group, and Deutsche Bank (lots 104,105,106,107). The auctions of Impressionist and Modern Art and Art of the Surreal in London in February will present 20 works from the total 220 works of art offered at a series of auctions, which started in Amsterdam and New York in autumn 2012 and continue in London, New York and Hong Kong throughout spring 2013. The roll call of further key artists featured includes: Salvador Dali, Francis Picabia, Giorgio de Chirico, Jean Arp, Kay Sage, Konrad Klapheck, Wifredo Lam, Roberto Matta and Victor Brauner.